It started shortly after 4 p.m. on Tuesday, May 22. Alarms went off in Hale Library. Employees reported smoke. The building was safely evacuated, and emergency personnel from the Manhattan Fire Department, Riley County EMS, Fort Riley, Blue Township and others responded. Manhattan firefighters on the roof of Hale Library as the sun sets on May 22, 2018. 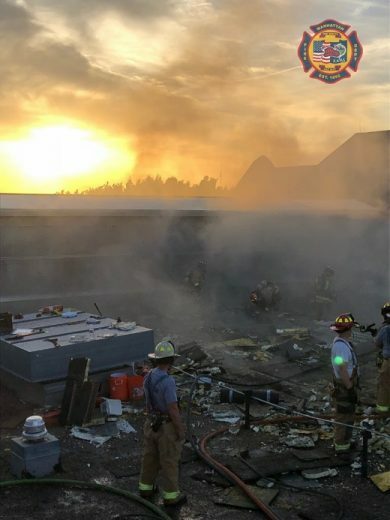 Photo courtesy Manhattan Fire Department. In order to save the structure, several hundred thousands of gallons of water flooded the building. Outside of the library, the entire K-State community experienced system outages. To protect the university’s data center, which is located in Hale Library’s basement, online tools such as Webmail, HRIS, KSIS and others were taken offline. By June 4 —thanks to efforts from staff from multiple units across the university who worked round-the-clock—vital services were restored due to generator power. 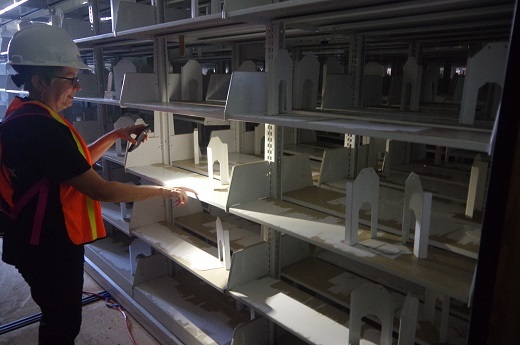 Additionally, since the majority of the university’s library materials were unavailable, the Libraries made it a priority to restore interlibrary loan services as soon as possible. They were up and working again by June 1. This is what K-State’s faculty, staff, and students experienced outside of Hale Library. 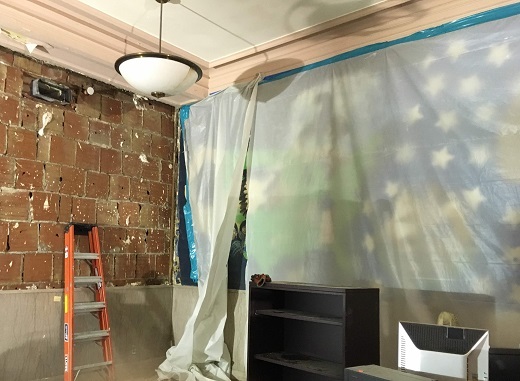 Inside of Hale Library, the damage was much, much worse than initially hoped. On May 24, President Richard Myers and Dean of K-State Libraries Lori Goetsch saw the destruction for the first time. Dean Lori Goetsch uses the flashlight on her cell phone to point out an outline left in the soot after wet books were removed from Room 117. Historic Farrell Library bore the worst of the destruction. Holes for the firefighting efforts were cut in the roof, and a lot of the water poured through that part of the building. The condition of the Great Room on May 24, 2018, two days after the fire. Many K-Staters are familiar with Farrell Library’s iconic Great Room, but most are probably not aware that the 1927 building also houses the Academic Learning Center (ALC), K-State’s athletic tutoring facility. The ALC is an essential study location that provides vital tutoring services for student athletes. The “We Have a Dream” mural, which was created 1978-80 by several multicultural student organizations, covers one large wall of the facility. The ALC will have to be gutted, and it is uncertain if the mural can be saved. The “We Are the Dream” mural is draped in plastic sheeting while drywall removal is conducted in the ALC. 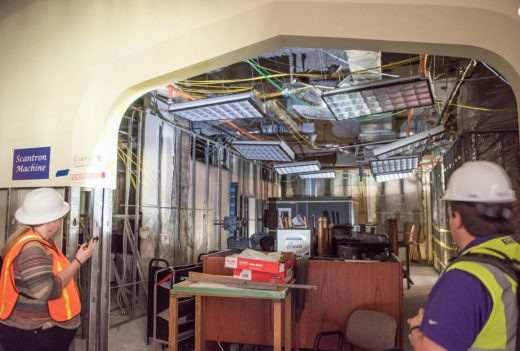 Below the ALC and Great Room, on Farrell Library’s second floor, the IT Help Desk, multiple iTAC offices and the Media Development Center were extensively damaged, as was the technology in those spaces. 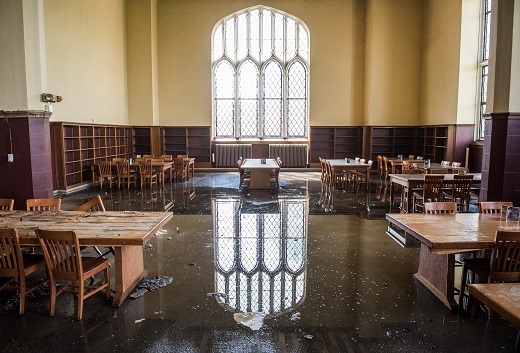 Nevertheless, even as K-State Libraries administrators were absorbing the scope of the disaster, they were also launching the recovery process. Within 48 hours, Belfor, an international disaster recovery and property restoration company, was on site to assess the damage. On May 27, more than 75 Belfor workers began removing wet carpet and ceiling tiles from the library. By June 1, their ranks had grown to nearly 200 workers from eight states. They swarmed the site, performing assessment, cleaning and determining what could and could not be salvaged. The ceiling tiles and the majority of the drywall in the Media Development Center on Hale Library’s second floor has been removed. Most of the carpet and ceiling tiles in the building have been removed, and it’s estimated that about half of the drywall will need to come out. Two weeks following the fire, all of Hale Library’s occupants—87 K-State Libraries faculty and staff members, 38 IT Services staff members, 2 Academic Learning Center employees and dozens of student employees— were generously welcomed into 13 temporary locations across the university. Many, many challenges lie ahead for the recovery effort. Even today, there is very little lighting since electricity has not been restored. The generators on the lawn power dehumidifiers and air cooling units in an attempt to keep the temperature and humidity more manageable. On hot days, it reaches 90 degrees inside the building. Workers have to wear hardhats, vests, and respirator masks, so that combination makes the heat even more oppressive. The sheer scale of the recovery for the 550,000-square-foot Hale Library is immense, and there are new problems to be solved at every turn. 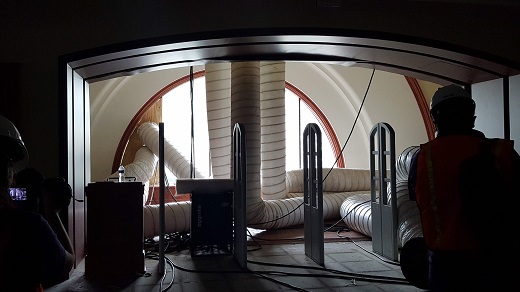 Some of the tubing that helps remove moisture from the building is piped out of the windows by the entrance to Hale Library’s main floor. This blog will be our place to share our journey, and we hope you’ll follow along as we plan for the future. The outpouring of support from faculty, staff, students, alumni, donors and other libraries around the country has been overwhelming. We are profoundly grateful for their generosity and kind words, and we know that with the K-State Family behind us, the long chapter ahead of us has a very, very bright ending for an exciting, new Hale Library. There’s a KState Foundation fund you can donate to to help with considerable expenses beyond those covered by insurance. Hale and Farrell will rise to an even greater future thanks to all involved in the recovery process. We can all do our part by donating to the Fire Fund. My heart is aching. I spent many hours studying in that great room, as did my parents. It’s heartbreaking, but also, I am so proud of the library and IT staff for their response. Thanks for the updates, Libraries staff. I am saddened by the consequences of the fire, but I am hopeful that Hale will bounce back much better than before. Despite these tough and trying moments, you still serve students and faculty. You have been a good friend to the library for many years, Audrey … we so appreciate your kind words! Today is the 100th day since the devastating fire that caused massive damage to Farrell and Hale Libraries. It would be extremely helpful if all readers of this blog would consider making a donation to the Fire Fund. We are deeply grateful for your support — and that you remembered the significance of this day!